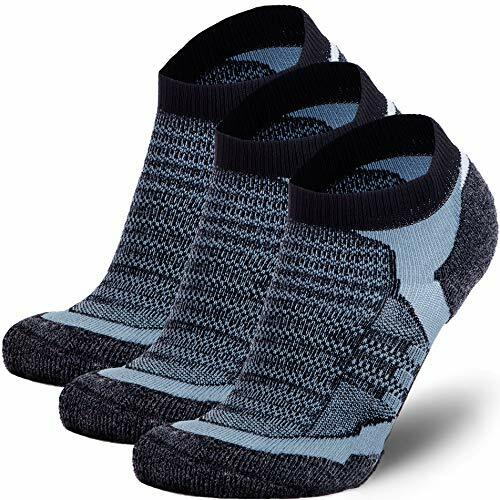 Balega Blister Resist No Show Socks for Men and Women blend the best of nature and technology, by combing natural and synthetic fibers for ultimate anti-blister performance. 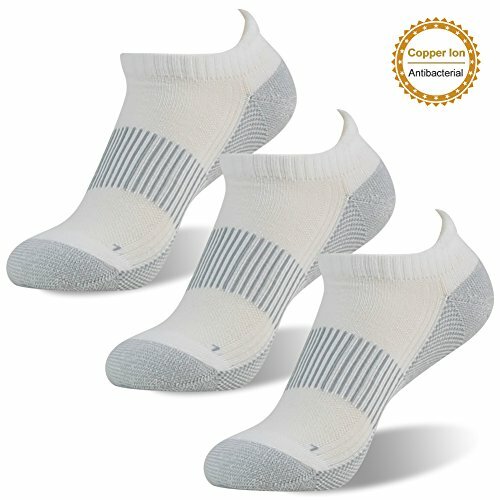 Soft, durable, natural mohair is known for being anti-friction, strong, shrink-resistant, and antimicrobial an excellent fiber for socks while proprietary Drynamix, along with specially constructed mesh ventilation panels, wicks moisture away from the skin to keep feet dry. Together they make an exceptional, race-tested sock that protects even the most sensitive skin against sheer friction blisters. The seamless toe box minimizes chafing across the top of the foot, and a high heel tab and extra deep heel pocket ensure that socks won t slip down into shoes during walks, runs, and hikes. The Balega Blister Resist No Show Socks features high-volume cushioning for comfort during extended activity. The Balega Silver Antimicrobial No-Show Compression-Fit Running Sock for Men and Women provides moisture-management and comfort without sacrificing fit and performance. Silver ions are encapsulated in the proprietary Drynamix yarn blend to promote an antibacterial, hygienic environment, keeping feet clean, dry, and free of odors, mold, and fungi. Constructed to mimic a running shoe, the varying tension of the fibers and knit patterns throughout the athletic sock lock in the heel and provide compressive arch support for grip and quick pick-up, while allowing the toes to move freely. The seamless, hand-linked toe box minimizes friction to prevent blisters and chafing. A high heel tab and extra deep heel pocket ensures that the sock won t slip down into the shoe. The Balega Silver Antimicrobial No-Show Compression-Fit Running Sock features medium-volume cushioning, ensuring durability for extended training and endurance events. NEW DESIGNED COPPER LOW CUT COMPRESSION SOCKS - Feel the immediate Comfort and remarkable design of your new Low Cut Running Compression Socks. They're easier and more convenient than knee high compression socks without compromising quality or Comfort. Premium Quality stitching for Running, Working or Cycling, Easy to get on even though they are compression socks! SCIENCE - Copper ions blend eliminates the growth of odor causing microbes on the fabric. As you might know Copper is a great conductor of electricity. 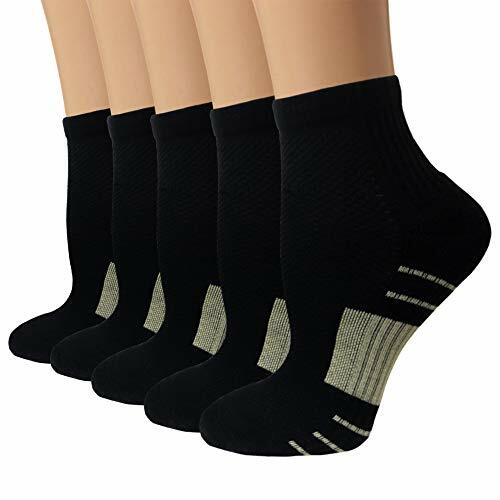 Through our socks, we are extending its natural property to rejuvenate blood circulation through your legs through copper fibers capable reviving blood circulation along with providing a 8-15 mmHg compression. COMFORTABLE METERIAL AND CAREFUL CONSTRUCTION - Stay put Cuffs & Soothing feeling at the bottom and sides of foot, with no pinching seen with lesser quality socks without ankle support. Moisture-wicking Arch and Ankle Compression to reduce fatigue, Blister Control, Lightweight, Double Welt Top, Heel/Toe Design and air-circulating ventilation blend keeps feet comfortable and dry. Good for your health. BUY IT WITH CONFIDENCE - Finest product and service guaranteed!!! Your satisfaction and good health is our top most priority. So shop with 100% confidence, if you are not happy with the purchase for any reasons, contact us for an exchange or 100% refund with no questions asked. 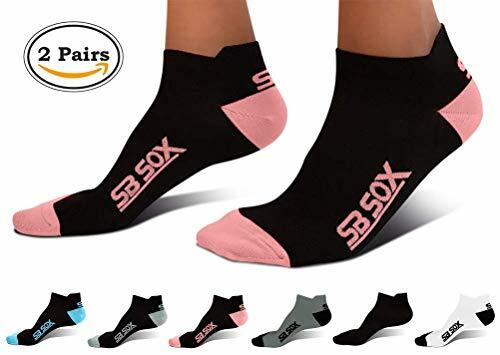 "...great quality socks, low price, free e-book, 100% money back guarantee, and a very strong social media presence..."
SB SOX use elastic layers that work perfectly together to stimulate blood flow, improving oxygen delivery to feet through the compression rating of 15-20mmHg. Improved Blood Circulation, Recovery, and Performance. Stimulates blood flow and improves oxygen delivery to your feet. Reduced Injury, Swelling, and Fatigue. Helps reduce injury and swelling - blood pooling and foot pain. Superior Construction and Comfort. Lightweight premium nylon and spandex material provide the ideal fit with breathable material. Provides for full range of motion and joint flexibility. Keeps your feet dry. FINALLY - RUNNING SOCKS THAT FIT JUST RIGHT - Tired of wasting money on running socks that have horrible seams, cause foot blisters, and just aren't sized right? We are too - which is why we designed our running socks to have a smooth toe/heel design and cover 4 different sizes with a wide range of shoe sizes including yours (see the 3rd image for the size chart)! You will LOVE our new running socks! IMPROVED BLOOD CIRCULATION WITH COMPRESSION TECHNOLOGY - Our compression technology (15-20mmHg) provides the ideal compression to provide the maximum boost to your blood circulation. Better oxygen circulation provided by our compression running socks helps aids recovery and any fatigue/pain in your feet. Why let yourself suffer any longer? Let our running socks help you feel great! #1 RECOMMENDED DESIGN: PREMIUM CONSTRUCTION AND COMFORT - Our compression running socks (15-20 mmHg) are recommended by doctors and preferred by trainers - they fit just right on your feet, not too tight, and provide unmatched comfort. We carefully designed and manufactured our running socks to provide premium support, comfort, and relief. Form fitting, lightweight, and breathable fabric features maintain foot stability regardless of activity. GREAT INVESTMENT FOR YOUR FEET (GREAT GIFT IDEA TOO!) - We spend so much time on our feet yet tend to neglect our feet. Why settle for anything less than fast relief at a great value? And while you are at it, grab a few pairs for your family, friends, or loved ones as a gift that is functional and beneficial to their health! Also, a great gift to runners, athletes, fitness workouts, hiking, tennis, cycling, office workers, airplane travelers, or anyone on their feet all day! Brand: Thorlos Experia | Manufacturer: Thorlo Inc. The low-show wool running socks feature next generation yarns to provide the most comfortable running sock available. 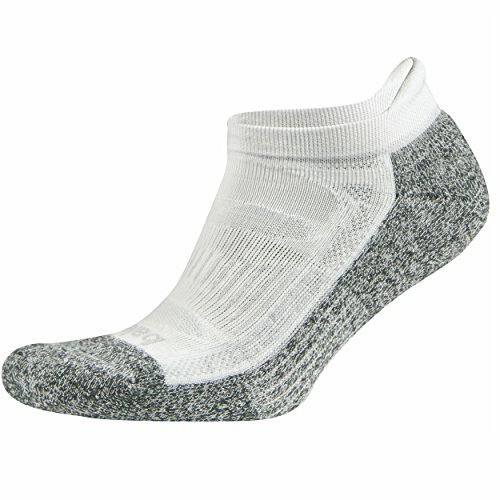 The wool running socks are made of a blend of blend of 53% Merino Wool/36% Polypropelene/7% Nylon/4% Spandex. Feet are kept dry thanks to the moisture wicking, hydrophobic properties of the proprietary wool blend. The merino wool socks offer cushioning and a seamless toe to help reduce blisters and irritation - making them perfect for runners. They can be worn year-round as athletic socks - as the wool is thermal regulating to keep feet at the perfect temperature. Special mesh paneling on the socks provide superior breathability. At Pure Athlete, we are experts in socks. We are a trusted 5 year old US based company. We are manufacturers of many of the bestselling running, hiking, and ski socks. Don't take our word for it, read our customer reviews and try our running socks. We know you will love them or your money back. We back all our products by a 100% satisfaction money back guarantee. The running socks are unisex - designed for both men and women. Choose your correct size below - based on US Shoe Size. PREMIUM NON-ITCH MERINO WOOL: Our innovative wool blend features next generation yarns to provide the benefits of wool without feeling itchy, Made of 53% Merino Wool/36% Polypropelene/7% Nylon/4% Spandex. The running socks are unisex, designed for both men and women. See the size chart below or in the image to the left for sizing. PERFECT WET WEATHER RUNNING SOCKS: The wool in the Pure Athlete Running Sock has advanced hydrophobic properties that help to repel moisture. This means that if the weather becomes inclement or you step in a puddle, the low-show wool running socks will still feel great. Use for everything from trail running, marathons, or any sports. CUSHIONED ANTI-BLISTER TECHNOLOGY, MOISTURE WICKING: A cushioned heel and toe prevents blisters. A seamless toe prevents irritation. The moisture wicking properties wick away perspiration, keeping the merino wool running socks light and dry. Anti-odor technology prevents the buildup of stink. USE IN SUMMER AND WINTER: Discover why wool is the best material for running socks. No matter the time of the year, use the No-Show Pure Athlete Wool Running Socks for superior performance. The thermal regulating properties of wool keep your feet at the perfect temperature - whether using as a cold weather sock or summer running sock. BUY FROM A TRUSTED AMERICAN COMPANY: At Pure Athlete, we are experts in socks. We are manufacturers of many of the bestselling running, hiking, and ski socks. Don't take our word for it, read our customer reviews and try our running socks. We know you will love them or your money back. We back all our products by a 100% satisfaction money back guarantee. Swiftwick ASPIRE is engineered with firm compression and a thin profile for a responsive feel. The firm compression supports every contour of the foot to reduce fatigue during endurance activities. Lightweight Olefin fiber in a minimum cushion design is cool, wicks moisture and dries quickly to keep you performing at your best. A thin-channeled upper and mesh footbed design provides ventilation to increase breath-ability. Zero no-show cuff height sits below the ankle with minimal extension above the shoe. 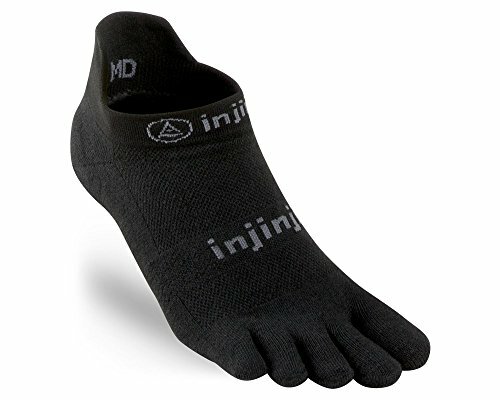 FIRM COMPRESSION: Supports every contour of the foot to reduce fatigue during endurance activities. CONTOURED FIT: Designd to hug the curves of your foot and stay in place. No voids, bunching, or blisters. Keep your socks under cover by grabbing the Balega Hidden Contour Running Sock, which features elastane and mesh construction, a reinforced toe and heel, and moderate underfoot cushioning to make your runs that much more fun. - Reinforced heels and toes for durability in high wear areas for long wear time. - Arch support provides elastic stretch and compression to help socks wrap tightly around the foot to prevent slippage. - Breathable mesh, help improve air circulation keeping feet cool and dry. - With reinforced heel and toe, they are extremely durable and made to withstand daily wear and use. - Strategic cushioning, softness and comfort to reduce foot fatigue and soreness from standing for long periods of time. - Unisex sports socks are not too thick or too thin, warm in winter and breathable in summer. Machine wash cold. Please do not dry clean, do not bleach, do not iron and drying them. Item will shrink if left in the dryer for too long. Best is to air-dry. MATERIAL OF NO SHOW SOCKS - Made of combed cotton and nylon. 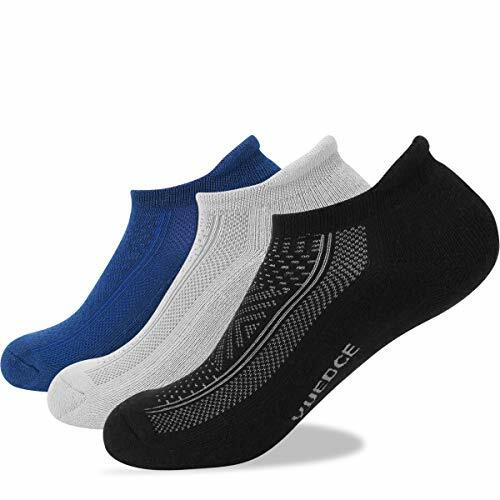 High quality material makes YUEDGE athletic ankle socks so soft and comfortable to keep your feet dry throughout the day. BREATHABLE MESH FUNCTION - Air venting mesh ventilation construction creates maximum airflow to keep your feet cool and dry in any running conditions. MAX CUSHIONING - Constructed with soft sole cushioning for adding comfort to reduce foot fatigue and soreness from standing for long periods of time. COMFORTABLE ARCH SOCKS - Arch support provides elastic stretch and compression, high tab heel ensures that your sock stays in place. OCCASION - Good matching for all of your favorite athletic shoes, running shoes, climbing shoes, boat shoes, jogging shoes or any other sports shoes. These ankle socks are also perfect gift for family or friends and will quickly become their favorite everyday stuff.